I think it's easy for people who have a reliable always-on internet connection to forget that much of the world does not. Even those of us who do may prefer not to use cellular data as much as possible. What I'd like is for the phone to sync as much data as it can while it has a Wi-Fi connection, on the assumption that I'm going to need that data when I'm offline. iOS is pretty good at this, but as I recently discovered on a trip where the hotel Wi-Fi only worked in the common areas and I had no cellular connection at all, both iOS itself and the apps I use had some big problems working offline. Ideally, Background App Refresh would launch every app that wants background refreshes whenever I'd encounter a WiFi network after having been offline for a while, but that's not how it seems to work. I couldn't predict which apps would have fresh data and which would not. Here's a quick rundown of the apps I was using and my experiences during an occasionally-connected week. Mail is the gold standard for apps that work either online or offline. When I was within WiFi range, mail would download, and I could then read it and reply whether I was online or offline. Any mail I wrote while offline would send the next time I was online. This is exactly how it should work. TweetBot would pull down the timeline if I launched it while in WiFi range, but wouldn't go get it on its own, I had to manually launch it. Safari Reading List seems like an ideal offline feature, but in practice, worked terribly. When you add a page to the Reading List, if you're online when you do it, Safari will go and cache the page so you can read it offline. 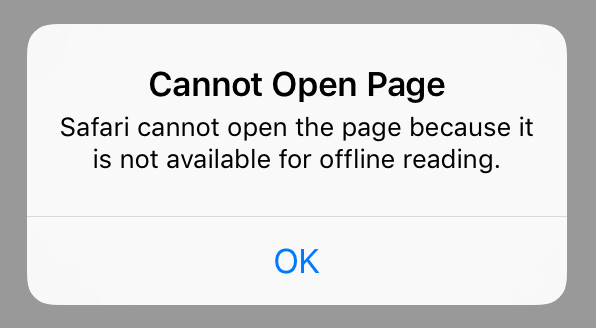 But if you're adding pages while you're offline, Safari doesn't proactively go and download the content of those pages when you do come back online. It also doesn't download pages that you added from a different device. This renders Reading List useless as you just can't predict what pages will be available. Music lets you sync playlists for offline playback, and this works well. The Washington Post app would download stories if I launched it while online, and keep them cached so I could read them when offline. Amazon Prime let me download shows for offline playback, but when I tried to play them in the hotel room, it had actually downloaded a French language version of The Grand Tour even though none of my preferences were set that way. Fail. Plex is awesome. I downloaded some shows to play in the hotel room when offline, and they played perfectly. Ulysses (and iCloud Drive sync in general) would sync if I was online, but didn't sync unless I was running the app. This is different from iCloud Documents and Data, which I believe would sync in the background even when you weren't running the app. The Apple Watch Weather complication would just show stale data while offline, with no indication the data was stale. Not good. I mostly place the blame on Apple here, for not aggressively triggering Background App Refresh for all enabled apps when the device found itself online. This entry was posted on Thursday, February 16th, 2017 at 11:18 pm.